Staff with a combined service to Ermysted’s of 116 years have left the school this summer. Stalwarts David Clough, Ian McLean and Pete Sykes have retired – between them they’ve worked at EGS for 87 years! A reception was held at school at the end of term to mark the retirement or departure of several members of the teaching staff, many of whom will be well known to Old Boys. David Clough (Deputy Headmaster), Ian McLean (Assistant Head of Sixth Form) and Peter Sykes (Head of Economics) have all retired this summer, having given a combined total of 87 years of service to Ermysted’s. Very few schools nowadays see this longevity of service, or can lay claim to such loyalty! Also leaving are: Mael Matthews (Head of Art) after 17 years – going to St Aiden’s at Harrogate; Nigel Kenyon, after 11 years teaching English and Music; and Tom Westgate who moves to a full-time position at Richmond School after a 1-year part-time role in our sports department. Many other significant things (besides the appointment of Mr Clough to the Ermysted’s staff) happened in 1988: Margaret Thatcher became Britain’s longest serving Prime Minister of the twentieth century, Paul Gascoigne its first £2,000,000 footballer and Graham Hick scored a (then) record 405 runs in a single County Championship innings. Those readers expecting a cheap joke at the expense of a much respected colleague will be disappointed to learn that D G Clough is not a vivid combination of those three figures. He is nothing like Paul Gascoigne. It is indeed an uncommon thing in the modern era for a member of the teaching profession to extend their career to 41 years. It is even more unusual that such long service should begin in the Bahamas before taking in Wakefield, Bradford and Skipton – surely this was the wrong way round. Dyed-in-the-wool tyke as he is, however, Clough claims much to prefer Harrogate to Harbour Island. Initially anointed Head of English, Mr. Clough oversaw innovation (such as the introduction of A-level English Language to EGS, making us the first school in the county to offer the subject) and involvement, increasing post-16 candidate numbers often to over 100. Characterised by the inspectorate as “inspirational and charismatic” and “an outstanding teacher” there is no doubt that he led from the front. 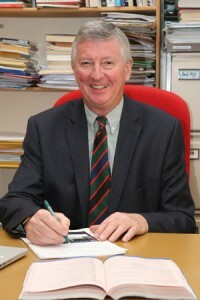 In 1995 Mr. Clough was appointed Head of Sixth Form (in addition to being Head of English), the capacity in which many will have best known him. Here he reintroduced Prefectship and commenced the Referral system for pupil support. He was responsible for Oxbridge entry and Careers advice. In 1996 Ermysted’s was listed 1st in the Top Ten State Schools for A-level results. Three years later, Deputy Headship followed and it is in this role that he has so ably served Ermysted’s for fifteen of his remarkable twenty-six years of tenure. His key responsibilities in Senior Leadership have included the curriculum and the school timetable, continuing management of the sixth form and university entry. He has also been instrumental in many other aspects of the school’s development such as the successful bids for the new Technology and English teaching block, and Specialist Science School status. More recently he wrote the Department for International Development ‘Global Partnership’ bid for our link with Zahira College, Sri Lanka, and visited Sri Lanka to initiate the partnership. Hambantota (delightful though it undoubtedly is) was nowhere near as pleasant, predictably, as Hambleton. A student of history generally as well as that of the school, in 1992 Mr. Clough wrote and produced ‘501 – The Pageant of Ermysted’ to celebrate the quincentenary of EGS’ foundation. Those who would contend that he sourced the entire thing from first-hand experience…need some lessons in manners. In total he has overseen 24 productions – a considerable commitment of time and energy by anyone’s standards. Of all of the testaments to David’s efficacy however, there can be few more profound than the outstanding success of the school in placing its students in higher education. Perennially, over 90% of Ermystedians depart for domestic and international university destinations. That this all seems to happen almost effortlessly is incredible, for it is no easy thing to achieve. In the past fifteen years hundreds of candidates have attended Russell Group and other high ranking universities. Approaching 200 have been successful in their applications to Oxbridge. This is not, however, to say that only the ‘top end’ is catered for. One of the real accomplishments of Mr. Clough’s career is that students almost unfailingly get onto not just any course, but the right one for them and that those for whom tertiary study is not an aspiration are equally effectively catered for. Such a record as teacher, guide and leader would surely be enough for most people yet it needs to be noted that Mr. Clough has also served in various capacities as an examiner, moderator and team leader for a number of boards, including acting as Senior Examiner and Assistant Chief Moderator. He has worked for JMB/NEAB developing the syllabus for GCSE English, and for Cambridge (UCLES) pioneering KS3 SATs. That over quarter of a century would have included the best of times (including such highlights as meeting Old Boys who have done well in their careers and who remember EGS with affection, and working with valued colleagues) is self-evident. That it would include the worst of times is also inevitable: the deaths of valued colleagues – Chris Davies, Delme Thomas, Sheila Muhleman, Paul Whitaker, Tony Capstick – have all been hard to bear. 1988 may well seem to most of us (assuming that we were even born then) like a foreign country, or to the great man, Lancashire. To have remained so steadfastly in one establishment is indicative of many qualities, not least of which is loyalty. It even suggests that despite his ‘100% Yorkshire’ bluffness, ‘Cloughy’ might actually have enjoyed odd days of it. Peter Sykes was born in Crigglestone, Wakefield and lived there all his early life. He went to Lancaster University to study Economics. Peter joined the school in September 1983 as part of the three amigos, Messrs Kelly, Armstrong and himself. Peter has two children: Rachel is a lawyer, and Rebecca is a doctor. He had taught for 3 years at Willowgarth Comprehensive in Grimethorpe, which he says was as far removed from EGS as it possible for a school to be. He admits it was a really tough baptism. There were 13 classes streamed by ability, and he had many of the bottom sets. However, he remembers that there was a great relationship with the pupils. This strong relationship with the pupils is the hallmark of Peter Sykes. When he applied to Ermysted’s he admits he was amazed when he got the job as one of the other applicants was an Oxford graduate. He was asked to set up an Economics department and told to get a lot of grade As. The post was to be on a trial basis to start with. As he was reassessed after a year, and is still here thirty years later, he must have passed the trial. Peter says that Ermysted’s was a bit of a shock after Grimethorpe. He remembers finding it odd that EGS called boys by their surnames, and that he felt it was a bit ‘cold’ at first. He also remembers first meeting Wally Evans. Peter has taught Economics A level very successfully since 1983. He introduced GCSE Business Studies in 1989 and ran it until 2003, sharing the teaching with Martyn Gill and Chris Fryer. Business Studies students ran the Green Fingers mini enterprise, selling plants to the public, using the profits to buy computers for the school. They earned a lot of money, Peter recollects happily, and had great fun while doing so. The achievement he is most proud of was winning the Fantasy football and Fantasy cricket leagues so many times. Hundreds of boys took part and the leagues were a vital part of EGS life for many years. He ran them and oddly, he frequently won! Peter is proud of sending so many boys to university to study economics. He remembers two in particular: Chris Mason, now the BBC Political correspondent, and Chris Pollitt, Head of Economics at Harrow School. It is a mark of the affection in which Peter is held, that when Chris Pollitt heard Peter was ill this year, he volunteered to come to Ermysted’s to teach Economics, in his holidays, for free, out of respect for the man. Peter is too modest to claim credit, but his Economics results have always been among the best in the school: one year he gained 26 A/A* grades out of 27 boys, including 9 A* grades. There was only one B! Many students have been inspired by his teaching, and have gone on to success at university and in the City. So impressive is his teaching that hardly anyone ever fails; he manages somehow to get even the dullest of students through somehow. He thinks that almost 50% of the boys he has taught have gone on to do an economics related degree, obviously inspired by Peter’s unique teaching methods. His gnomes are famous (they are used as a teaching aid) Boys often buy him gnomes when they leave. Peter has always kept in touch with boys when they have left Ermysted’s. He often puts current boys in touch with ex-pupils for advice, which has been really useful to them. Peter has long been a staff football and staff cricket stalwart. For many years he was Assistant Head of Sixth Form, forming a strong team of sixth form management with David Clough and Ian McLean. On retirement Peter will be a member of Yorkshire CC. He has applied to the Barmy Army and hopes to go on tour with them. He and his wife will be going to Europe in their caravan for two to three months at a time. They both do a lot of walking. Other retirement opportunities include reading books he has never had time to read (he has hundreds of books piled up ready to go.) Peter also likes cooking, and going to the gym. He enjoys home brewing wine and beer and he intends to use his Bradford City season ticket. Ermysted’s will miss him. Nigel Kenyon came to Ermysted’s in 2003 ostensibly to teach English after a number of years leading a performing arts department in Eastbourne. After some time it was realised that he had other considerable abilities in the field of music, having taken a degree in English and Music at Leeds University. With the expansion of the school he was taken on by the Music Department to teach A Level and GCSE and has continued to do so until his recent early retirement. During his later years at the school he had more than enough to cope with, providing unfailing care for his partner Marian who, sadly, passed away earlier this year. He has always been willing to offer his own time in support of those brave souls who tackle A Level music, giving extra lessons wherever needed. Most of this selflessness stemmed from his own experience at school where he was given extra lessons himself for music and it is a measure of the man that he readily repaid that personal debt. He has most certainly made the path for those taking music at university a little easier. A veritable fount of knowledge on all things musical and a dedicated Wagnerite who has spent the last four years following Opera North’s journey into the depths of the Nibelungs. As a counterpart to this Romantic urge his own interests in composing are much more cerebral. He is an avid supporter of the Huddersfield Contemporary Music Festival (who else would sit through four hours of creaky doors and nails thrown into a piano simply so he could say ‘I was there’! ), and someone who has a very eclectic and wide-ranging sphere of musical interests. However, as some pupils discovered aeons ago, his violin playing days are probably now over, which is something of a relief to us all. It would also seem somewhat amiss if mention were not made of Mr Kenyon’s love of Dr Who (he would readily acknowledge he is a Whovian), always a bit of a sore point with the Trekkie loving Mr Gregory who is convinced that the phaser would win in a shoot-out with a sonic screwdriver anytime. Always an early bird and the life and soul of the staffroom where his ready wit would enlighten a gloomy Monday morning – tall tales told with an unmistakeable Lancashire burr. We shall miss his pleasant and amenable character, reminiscences about classic recordings (of which he also had an encyclopaedic knowledge), and his contribution to the school and department. We wish him well and hope he can build-up enough stamina for the complete Ring Cycle in 2015 in Leeds - all four days of it. Even Dr Who can’t make that piece any shorter!